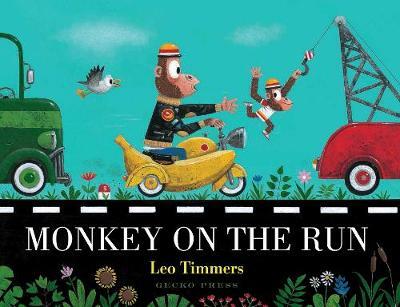 Papa Monkey and Little Monkey are on their way. But the street is very busy and they are going so slowly! Little Monkey loses patience and jumps onto the fire engine. Up the ladder from there and he joins a TV crew! Then the garbage truck, an aquarium bus, a food cart for rabbits... read full description below. Papa Monkey and Little Monkey are on their way. But the street is very busy and they are going so slowly! Little Monkey loses patience and jumps onto the fire engine. Up the ladder from there and he joins a TV crew! Then the garbage truck, an aquarium bus, a food cart for rabbits packed with carroty treats, Arctic animals traveling by snow globe, a jewel thief's getaway car . . . There is so much going on in the street, it's become a playground! Each vehicle in this wordless picture book contains a world of detail, activity and humor to share with curious toddlers. 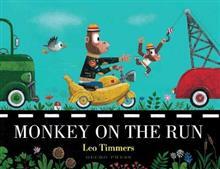 Leo Timmers is one of Belgium's preeminent picture book authors, with a large and loyal following. Trained in graphic design, he illustrates magazines as well as picture books. He lives in Brussels with his wife and daughters.